In anticipation of our Second Annual Graphic Novel Event, Superheroes and Scholars, on Wednesday, Nov. 17, 2010, we asked a few University staff members to tell us about their favorite graphic novels. Step aside, Batman and Spider-Man. What if characters from your favorite novels could join forces to battle evil? In The League of Extraordinary Gentlemen, Alan Moore’s (V for Vendetta, Watchmen) high adventure graphic novel, a quintet from classic literature does just that. Mina Harker of Dracula, Allan Quatermain of King Solomon’s Mines, Dr. Jekyll of Strange Case of Dr. Jekyll and Mr. Hyde, Captain Nemo of 20,000 Leagues Under the Sea and The Invisible Man from his eponymous novel defend all of England from Fu Manchu, even enlisting the aid of Sherlock Holmes’ nemesis Professor Moriarty. It’s thrilling stuff—not to mention there’s a climatic airship battle. Moore’s rollicking, imaginative storyline gives avid readers new twists on old characters, but people unfamiliar with Harker, for example, will still enjoy the ride. 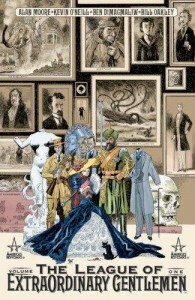 Add in Kevin O’Neill’s anxious illustration of Victorian London and, unlike the mediocre film adaptation, The League of Extraordinary Gentlemen graphic novel easily stands up to many readings. Be warned though: the story—like all of Moore’s work—contains mature themes. 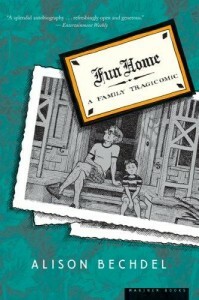 Alison Bechdel’s Fun Home: A Family Tragicomic, that took the author seven years to complete, is a graphic memoir rife with literary allusions, obsessions with death, and the presence of the always compelling dysfunctional family. Tolstoy was right when he said, “Happy families are all alike, every unhappy family is unhappy in its own way.” The Bechdel family’s odyssey, in part, involves both a father and daughter who struggle with their own sexual identities, and a mother who battles her husband’s midlife emotional distance by returning to her theatrical roots and performing in local theatre. The non-linear narrative captures the reader’s imagination. One is naturally intrigued to follow the narrator’s journey to distinguish her family’s truths and myths. Did the father commit suicide only weeks after the mother asked for a divorce? Or was his collision with a Sunbeam bread truck (as he crossed the road) a freak accident? Will our young narrator live with a lifelong guilt associated with her father’s death? This poignant and deftly drawn graphic memoir delights and haunts on every page. 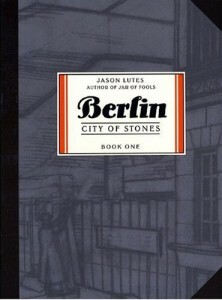 Since 1996, Jason Lutes has written Berlin, an on-going series taking place in the later years of the Weimar Republic. The two main characters on Marthe Muller, an art student experiencing life in the big city for the first time, and Kurt Severing, a world-weary writer, journalist, and pacifist. The two start as friends, have a love affair for several months, and then fall out of love as the political and social scene of the city spins out of control. Nights out at dance clubs become increasingly decadent. Meanwhile rallies and demonstrations become more polarizing, eventually descending into brawls and shoot-outs between Nazi and Communist gangs. There are also a host of sub-plots to provide a fuller picture of Weimar Berlin, including a family of assimilated Jews trying to stay out of politics, Marthe’s fellow art students, and a group of African American jazz musicians. An especially notable sub-plot follows a family that breaks apart over politics; the mother and daughter joins the Communists while the father and son join the Nazis (giving the reader a look at the inner-workings of both parties). Two collections have already been released as two eight-issue parts, Berlin: City of Stones and Berlin: City of Smoke. A third and final part (as yet untitled) will take the story to the Weimar Republic’s final overthrow by the Nazis. Next week, we’ll have reviews of the Scott Pilgrim series, Preacher, and The Storm in the Barn. Until then, what are your favorite graphic novels? Comment here, or tell us on Twitter or Facebook!